Dr. Oz listens to experts explain the many benefits of the Paleo Diet lifestyle. If you haven’t heard about the Paleo Diet or “eating like a caveman”, Dr. Oz entertained experts on April 23, 2013 about this healthy way to eat to help explain just what it entails and what those health benefits might be. The Paleo Diet is not a low carb style diet – it focuses on healthy lean proteins like grass fed beef, wild caught seafood and organic free range chicken with non starchy, fibrous vegetables and fruits, some seeds and nuts and healthy fats like coconut oil and avocado. The Paleo lifestyle eliminates dairy, legumes, whole grains and refined sugars. A typical Paleo meal would be about 2/3 of your plate filled with fresh (organic, if possible) vegetables, about 4-6 ounces of a lean protein like organic grass fed beef or wild caught seafood or free range chicken (about the size of your palm, there’s no weighing or calorie counting here), a small portion of a healthy fat like a slice of avocado or scoop of guacamole and a couple small pieces of fruit. This is the plan for all your meals and some find it simpler to eat leftovers for breakfast rather than cook a grass fed steak, for example, in the morning. Healthy smoothies are also an option for breakfast. The experts state that if you follow this plan for 30 days you will eliminate cravings for unhealthy, processed foods and slowly lose weight for maximum benefit. The other biggest advantage appears to be a reduction in inflammation within the body which can be the root of many other ailments. It is also claimed that this way of eating is what our bodies were designed to eat and that this balanced diet provides your body with nutrients that are less likely to be rejected. The Paleo diet/lifestyle seems to work best and is most affordable when you prepare your own healthy meals with quality ingredients like Topline Foods organic grass fed meats, free range chicken and wild caught seafoods. Shopping online for the best price and getting all your healthy, grass fed beef, organic chicken and wild caught seafoods delivered to your door saves you time and money, we even have a Paleo Diet Approved shopping category. Coming home from work to a freezer full of the best quality lean proteins will make preparing dinner quick and easy. Most items are individually portion controlled and vacuum sealed so they can be quick thawed in a sink of cold water in only 10-15 minutes before seasoning and cooking. 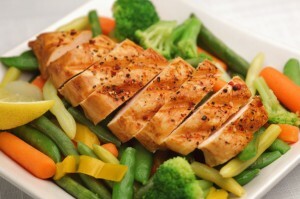 Let Topline Foods help you attain your goals through “eating like a caveman” while saving you time and money! Shop online today! This entry was written by Jeff, posted on April 23, 2013 at 11:25 pm, filed under Blog, Paleo Lifestyle. Bookmark the permalink. Follow any comments here with the RSS feed for this post. Both comments and trackbacks are currently closed. But a true paleolithic diet is impossible to mimic because wild game is not readily available, most modern plant food is cultivated rather than wild, and meats are domesticated. At best, you can eat a modified version of the original diet that’s gluten-free and includes lean meat, organ meats, fish, poultry, eggs, vegetables, fruit, and nuts. It’s a wide variety of foods.